OK, first let us ALL get this one thing straight: What Rob Bell says is one thing, what the Bible says about Biblical Universal reconciliation is another. The Bible makes it clear that no one gets into the Kingdom / heaven without confessing Christ as Savior and Heir to all God's creation; It also teaches that ALL mankind will do so - either by free-will or no free-will. ALL shall bow their head and ALL shall bend their knees. let us ALL get this very clear: Biblical Universalism does teach the believing in Christ as a part of this salvation. Rob Bell may say one thing and then another and even say things different from the Bible, but that is his opinions. let us not define Biblical Universalism on what Rob Bell says. Ross, thanks for the comment. The accusation you seem to be making, if I’m hearing you right, is that I (or we as a community) are somehow defining Universalism based upon what Rob Bell has said in his book. On the contrary, all I said was, “in reading this book one gets the idea that he is a Universalist.” I know what (Biblical) Universalism teaches, and I know that there are a lot of people who have difficulty with the (Biblical) doctrine of Hell. Ultimately, neither of those points were the purpose of this blog post. Rather the purpose was simply to share my impressions and thoughts on Mr. Bell’s book. Yes, there are some Scriptures that say that ALL will be saved. No argument here. However, there are also many other Scriptures that seem to say exactly the opposite; and many of those attributed to Jesus himself. At the very least this ought to cause one to wonder about how we tend to interpret Scripture. For example, based on the common interpretation of “Gehenna” as “Hell,” we must not overlook the fact that Jesus had a lot to say about this as being a place of final separation of the wicked from the godly. (Yes, I know of the arguments by some that Gehenna was simply a garbage dump and has no spiritual application). Jesus spoke of hell (Gehenna) as a place of judgment and a place where the body of the wicked will be thrown. He spoke of the wisdom in being afraid of the One who can destroy both the soul and the body in hell (Fear of the Lord). He spoke of torment in the fires of hell, which never go out, and the sons of hell. He spoke of an impassable chasm between heaven and hell. 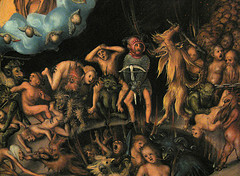 He even asked some how they expected to escape being condemned to hell. Peter and Jude added that blackest darkness is actually reserved for those who do evil, and James says that the tongue itself will be set on fire by hell. (References: Matthew 5:22,29; 10:28; 18:9; 23:15,33; Mark 9:43; 13:30; 13:49; 25:32; Luke 12:5; 16:26; 17:34; James 3:6; 2 Peter 2:17; Jude 13; to mention but a few). How are we to reconcile the two? I do not pretend to have the answer except to say that Hermeneutics teaches us, among other things, that Scripture must interpret Scripture, and that we cannot simply take a verse here and there out of context to say what we wish. In other words, what do the other Scriptures (and especially Jesus’ own words) say about the Scriptures dealing with (Biblical) Universalism? Therein is the dilemma. Does the Bible contradict itself? Of course not. Yet obviously somewhere between these two “apparent” opposites lies the truth. Perhaps the answer lies with the Apostle Paul who said, “Now we see but a poor reflection as in a mirror; then we shall see face to face. Now I know in part; then I shall know fully, even as I am fully known. And now these three remain: faith, hope and love. But the greatest of these is love” (1 Corinthians 13: 12,13; NIV). Can we rest in that?